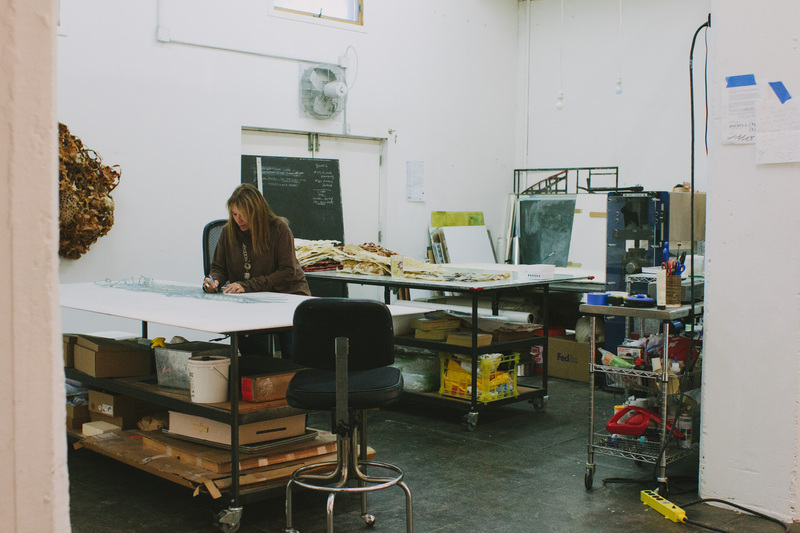 a studio tour with Joan Hall. 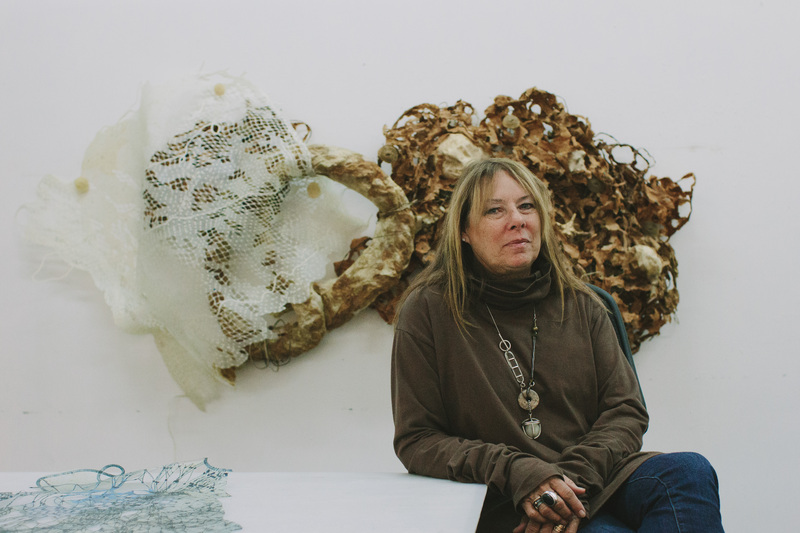 A conversation with Joan Hall, and a look inside her studio. 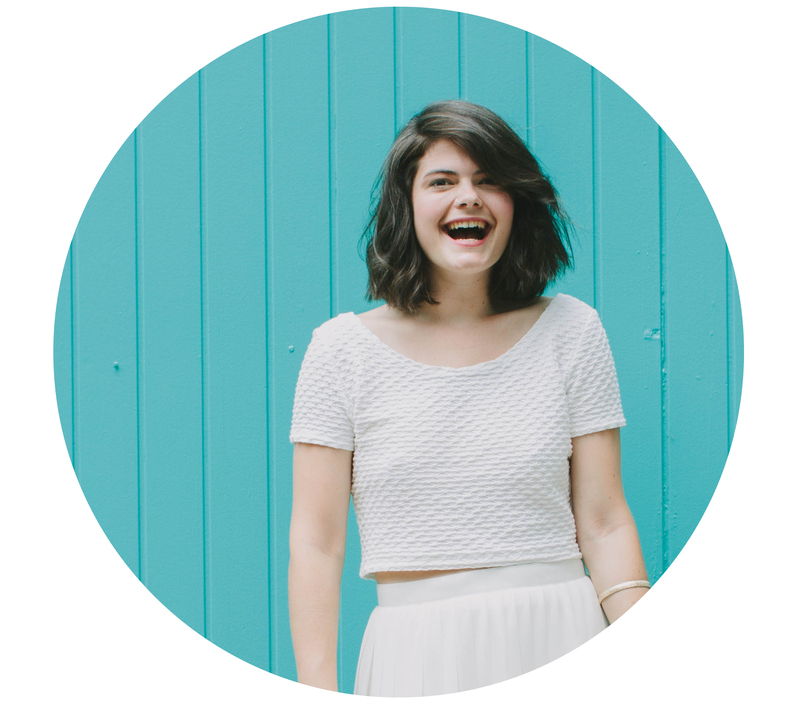 Hailing from Ohio, Joan landed in St. Louis after school to teach at Washington University. 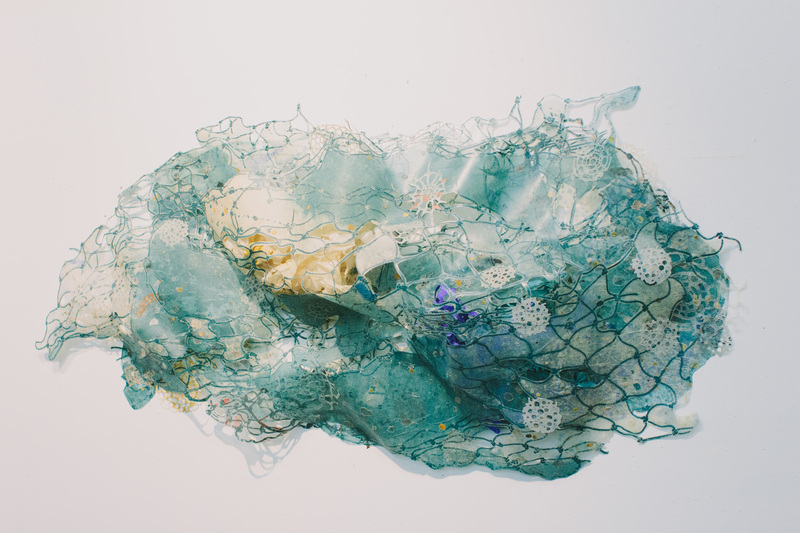 Through her art, she speaks to her passion for sailing and opens up a social discussion on the amount of plastic in the ocean. 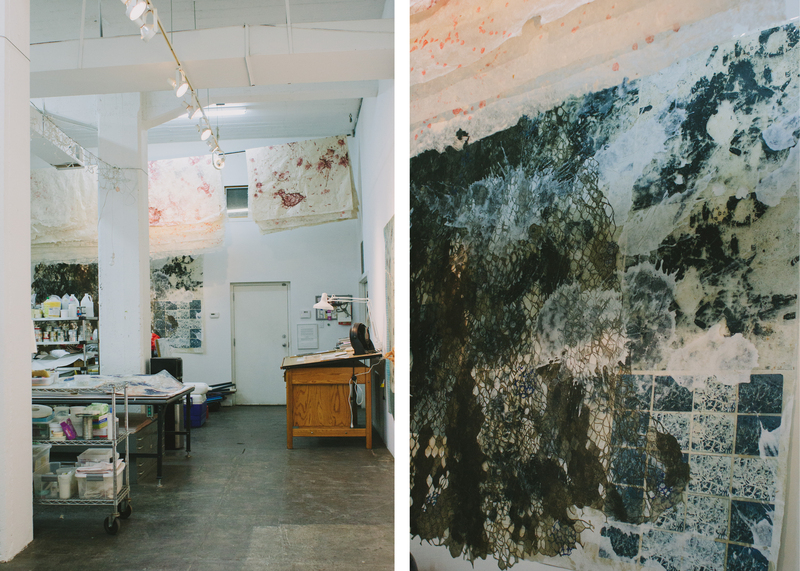 A look inside Joan’s studio in downtown St. Louis inspires – from the handmade paper hanging from the ceiling to the large scale works covering the walls. What work were you doing when you first started? I had an interest in things that were sculptural, but I love paper, so I ended up actually focusing on printmaking and ceramics. In graduate school I met a guy named Garner Tullis who was running an experimental paper studio out in California at the time. I’ve always liked making paper, but when the people at Twinrocker were telling me how much money you need to build a beater in order to make paper, I scoffed. I thought, “I can’t afford that for a long time.” Tullis said, “do you have a sheet of paper?” and I handed one to him. He throws it in his mouth, chews it up, throws in on the chair in front of him, looks at me and said “I just made paper”. My first thought was “who are you?” And then I learned how to make paper from him. That’s where it started in 1977. I always thought of paper as more than just something you worked on, but I realized over time that there was something about ceramics and something being more sculptural. So I blended this sort of way of printing to me that was a sculptural mark with making my own paper, which I could then do anything I wanted to with. Tell me about the inspiration behind your work. I’ve been sailing boats since I was 16 and was interested in water. It’s been sort of the underlying theme of my work all of my life – something to do with water. Whether it was drawings I made when I was out on the ocean sailing, or things that I documented like the motion or the colors. I love things like printing and paper making. 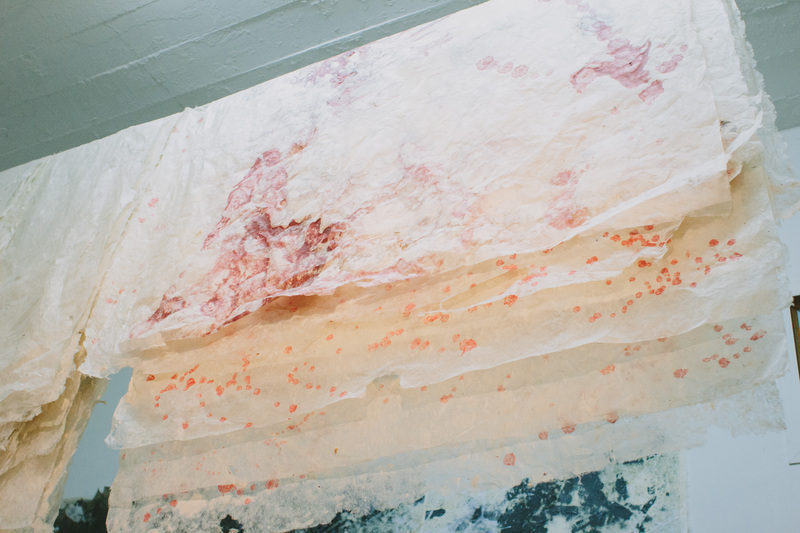 Paper making, because you don’t know what you really did until it dries, and printing because you don’t really know what it looks like until it comes out of the press. There’s this part of art that I like that is indirect, and I also like not being totally in control. I love to sail, but I don’t like motorboats. When you’re out in the water you really don’t have complete control. That’s the part of it to me that’s exciting, that I enjoy. When did you decide to start doing work that had a social commentary? In the early 90’s I did a few pieces that had to do with an oil spill that I saw off the coast of Rhode Island. I had some pieces I had done here and there where I sort of brought that [social commentary] into it. It wasn’t really a huge focus. I did a whole series of things that had to do with Cuban rafts and people migrating to the United States. Now, in my current work I’m really interested in making people interested in the amount of plastic in the ocean. How has your work progressed over your career? In 2005 I got sick, and I didn’t work in the studio for 4 months. It was an odd thing because I’ve always worked all the time. I started thinking about how I felt like a fish caught in a net and had no control. A friend of mine had given me a net years before and it was sitting in a box. I started thinking about the net as a metaphor. I was caught in the net and it was really personal. My work kind of does this thing where it sort of slowly morphs. The piece that is at the Contemporary Art Museum for Art:314 is called The Soul Sails. There was a second piece called The Body Anchors. It was a metaphor that on the water I always felt free, and so those pieces have to do with travel and the navigation elements. Most of my work is really large. I always like people to be in my work, not looking at my work. I think it’s sort of this sense that when I was in the ocean – when you’re out of sight of land, it’s this horizon and you feel really, really tiny. That’s a sensation I love. The bigger I can make a piece of art, the better. Give me a wall and I can fill it. It might take me a while, but I can fill it. Tell me more about people being “in” your work. There are lots of layers and lots of materials. When you navigate on a boat, you log your journey, so I thought of the idea of a notebook and logging my journey through the piece. There are things hidden in it that you can’t see. I like people to be overwhelmed by scale. There’s so much going on in the piece, and also the process is sort of foreign for people. There’s detail, so people will walk up to the piece and stare at it. Sometimes there are little hints in them and they’ll get a sense of what the work is about. If you look close enough, on that piece [the first image] there is a little yellow rubber duck. You have to look really hard. Tell me about people who influenced your career. Early on, there was a woman by the name of Eva Hesse. She worked with latex and unusual materials. I always loved her work because it was very ethereal. It wasn’t traditional sculpture. When I went to school, I think I moved into printmaking because I didn’t like the idea of what sculpture was or what painting was. I wanted to do something that was more free-form and wasn’t very popular at that time. I started making paper, because you could mold thick paper into shapes to create instillations and things. Printmaking as a flat medium never interested me that much. I took the materials I liked and made them do what I wanted them to do. The paper being the underlying source of that. What tools do you work with most? A press, a scalpel, and printing ink. Beauty. For a long time in the arts, I think that was something that was left out. I also wanted to take something like paper and elevate it beyond craft and making paper, I wanted to make art with paper. Beauty is really powerful, and if you make really beautiful art, you can maybe get people to see the message. You also have to understand that I was a young artist in the 80’s when they thought unless your work is brown and black and dismal and had really serious messages, it wasn’t real work. I was anti that. I wanted to make things that are beautiful and I didn’t care. I’m going to do things that I want to do. 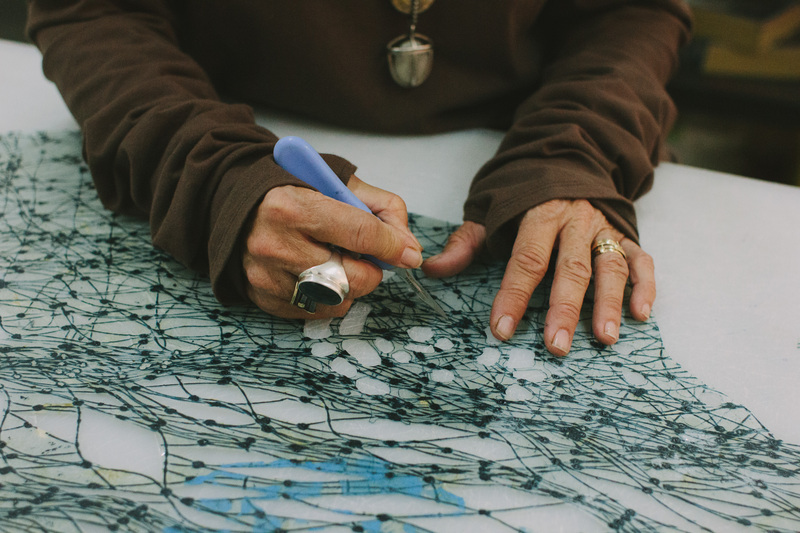 You can see Joan’s piece, The Soul Sails, at the Contemporary Art Museum this Friday during Art:314. Join me for the silent auction (featuring The Soul Sails) and a raging party! Use the code CIAJ1975 here for $10 off tickets. Peek at the list of all the works being auctioned off that evening. I was invited by the Contemporary Art Museum St. Louis to explore their Young Friends Program. I received complimentary access to events, but all thoughts and opinions are my own.